Every creative has their muse. I've discovered I do a whole lot more creative thinking when I surround myself with great inspiration sources. And the original ideas I come up with are better as a result. 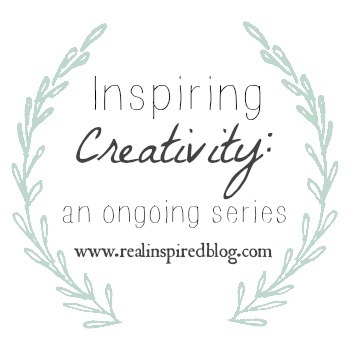 This is part of feeding and nurturing your creativity! I have a few favorite places I like to hang around that inspire me. 1. Pinterest - This one goes at the top of the list. It's like a buffet of ideas. And you don't have to pin everything either. I've become way more selective in my pins over the past year or so that I have been using Pinterest. I've even gone back to old pins and weeded them out. Sometimes, I might not use a particular idea that I've found on Pinterest, but it will get me thinking in a direction I would have never thought of before. That's the great thing about inspiration. And that is creativity. 2. Better Homes and Gardens - I love, love, love, love Better Homes and Gardens! It was the very first home magazine that I was exposed to, back when I was a young warthog. Loved it then, love it now. I still check out their magazines when I'm in line at the store or at Barnes & Noble. And there's the website too, which is full of fun things, pretty pictures, and fabulous ideas! 3. Nesting Place - If you haven't checked out The Nesting Place, then do it. Do it now. Probably my absolute favorite blog! Myquillin(The Nester) shares her home and how things don't have to be perfect to be beautiful. 4. Young House Love - Another favorite of mine! John and Sherri are DIY'ers at Young House Love. A lot of what they do is pretty ambitious to me, like laying flooring and building pergolas, but they break down the steps and how they go through the process of making their plans come to fruition. But it's not all big DIY projects. They have easy ones too. 5. TV - We don't have our TV hooked up to an antenna, much less cable, but I do love me some home shows! If I am anywhere that has cable that I can control, you will probably find me watching HGTV or the History Channel. I watch it like other people watch sports. There might be insults, yelling, and eye rolls. Especially for that one guy that always decorates in purple. Seriously, dude, pick another color from time to time. So there it is! 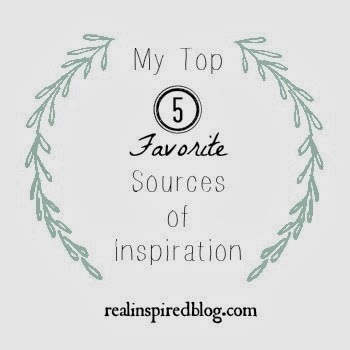 My 5 favorite sources of inspiration. Do you have any others you would add to the list? Where do you like to go to get your inspiration? Leave it in the comments!